The word "flabby" can mean different things to different people, but it's probably safe to describe the existential state of flabbiness as some combination of underdeveloped muscle and excess fat. Of course, when it comes to improving body image, well-toned and shapely arms are usually at the top of the list for both men and women, and yoga does indeed offer many poses that will bestow the arms with strength and definition. LIVESTRONG teamed up with yoga teacher Elise Joan to bring you this yoga flow that will help you sculpt a strong and toned upper body (including your arms!) arms in less than 10 minutes. Much if not most of the muscle work in yoga is isometric, meaning that you strengthen your muscles in a static position by pitting them against each other or against gravity. With isometric exercises, the muscle's length doesn't change. Because you maintain a static position while doing them, they'll tighten muscle in only one particular position, so you'll need several different angles of attack to cover all bases. Fortunately, yoga is designed to mix and match positions. An excellent place to start is with the plank pose, one of the most basic but effective yoga poses. Basically, you assume a position as if you were at the top of a push-up and hold it for as long as you can. Planks — and its many variations — work your arms from the wrists up to the shoulders, but especially the triceps. They also have the added benefit of strengthening your core muscles, especially if you throw in abdominal bracing while you're at it. Bending your elbows, lowering yourself into Chaturanga and holding it their for a few breaths will work the arms even more. You can also combine your planks with the tried-and-true Downward Dog pose, which elongates the back muscles and builds shoulder strength to boot. Or, start in an upright position and you've got the makings of a rather complete exercise called Sun Salutations that require you to stretch your arms toward the sky, which is also good for toning flabby arms. You can have great arm muscles, but they'll just be a well-kept secret if they're covered up by too much excess body fat. If you're overweight, by all means do yoga, but you'll need to lose weight while you're at it. Alas, despite its incredible abundance of benefits, yoga isn't great for burning calories; according to the American Council on Exercise, you can expect to burn only about 144 calories in a 50-minute Hatha yoga class. Even Power yoga burn only about 237 calories in 50 minutes. Read more: Is Yoga or the Gym the Best Way to Lose Weight? In light of the fact that you've got to burn 3,500 calories more than you take in to lose a pound of fat, that would mean many hours of yoga. What's more, there's no such thing as "spot reduction." As your overall body fat melts away, your arm muscles will eventually see the light of day. But unfortunately there's no way to target them diet-wise. However, yoga has been shown to boost people's weight-loss efforts, probably because tuning your mind into the yoga channel makes you more mindful of all kinds of things, such as how many cheeseburgers you jam into your mouth. 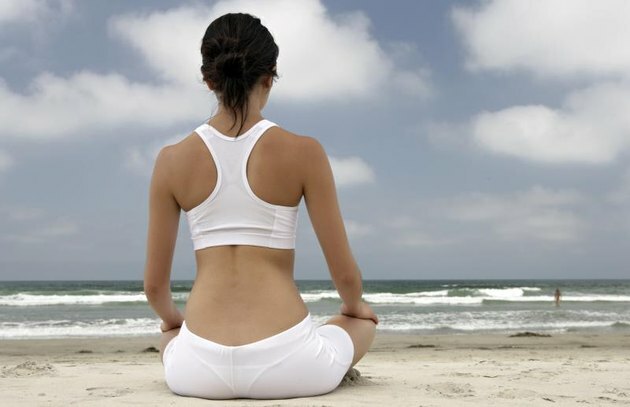 Read more: What Kind of Yoga is Best for Weight Loss? Do you practice yoga? Are you trying to tone up your arms? What are some of your favorite yoga poses to strengthen your upper body? What other arm exercises do you do? Share your thoughts, suggestions and questions in the comments below!